Make small pieces from boiled potatoes. Take a pan and heat oil. Add mustard seeds, cumin seeds, asafoetida, garlic paste and stir it 2-3 times. 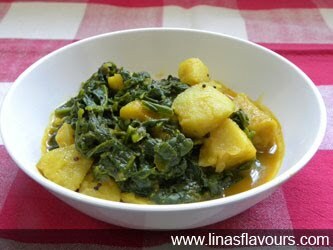 Add fenugreek leaves, potato pieces, salt, red chilly powder, turmeric powder and saute it for 2-3 minutes. Add 1/4 glass of water and cook it for 4-5 minutes. Add lemon juice and mix it well. If you want your vegetable dry, you can avoid adding water. Serve it hot with rice, roti or paratha (Indian flat bread).